At Neon Crab Tattoos & Piercing, we know how important Dads are in your life, and with Father's Day just around the corner, we want to help you make it a great day. 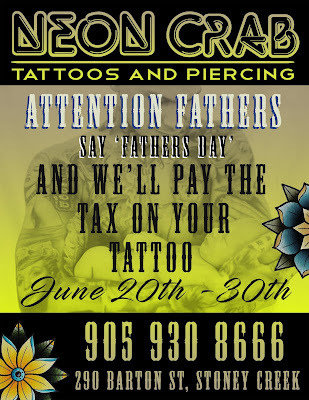 So come on in to Neon Crab Tattoos & Piercing in Stoney Creek at any time between June 20th and June 30th, say "Father's Day", and we'll pay the tax!! So if you are a dad, or have one.....bring the old man in and get him that tattoo he's always wanted. He'll remember it for a lifetime. And hey Gift Certificates are always available!